Jim McLean has worked with many of the best PGA Tour Professionals but his dedication to the Amateur player is what sets him apart. 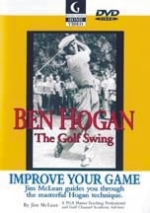 His reputation as one of the premier instructors in the game is enhanced even more as he breaks down the fundamentals of Ben Hogan’s golf swing. Using never-before-seen footage, he explains step-by-step the elements that makes Hogan’s swing, one of the greatest, if not the greatest of all time. Some of the game’s best players have commented on Ben Hogan. They include: Gary Player, “Hogan knew the most about the golf swing.” Ken Venturi, “Hogan was the greatest course manager I’ve ever seen.” Ben Crenshaw, “Hogan had one of the greatest set-ups you ever saw.” Now, Jim McLean simplifies the mechanics of Ben Hogan’s legendary swing, and guides you through the masterful Hogan technique that will help golfers of all skill levels to improve their game.